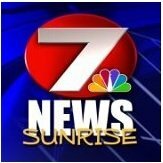 News TV Channel / KPLC, channel 7, is an NBC-affiliated television station located in Lake Charles, Louisiana, United States. KPLC is owned by Raycom Media, and has transmitter facilities located in Fenton, Louisiana. Its studios are located on Division Street in downtown Lake Charles. KPLC-TV began broadcasting in the summer of 1954. Owner T.B. Lanford of Shreveport had previously signed on KPLC radio (1470 AM, now KLCL) and was eager to expand into television. The station was later purchased by a St. Louis group headed by investor Elliot Stien. He visited KPLC frequently along with his friend, St. Louis Cardinals baseball legend Stan Musial.